To get a full taste of the entire country, and even the whole world, what better place than the capital? They say, no one is an “original Delhite”. Everyone has come from some corner of the country and brought a part of their native place back to Delhi. A melting pot of cultures does not even begin to describe Delhi’s rich history of food, culture, politics, architecture and so much more. Everyone has managed to settle in and make Delhi their home and the cuisine is the remarkable highlighter of it’s varied inspirations. From the Bengali-ness at C.R Park to the pride of Bihar at Pot Belly Cafe, from the rich Mughal heritage at Chandni Chowk to the buffet lunches at Kerela and Andhra Bhavans, Delhi has a little bit of everything to offer. Always thriving with eager customers! Lo! How could one talk about Delhi’s gastronomic delights and not start with the best non-vegetarian restaurant since 1913! With new outlets mushrooming all over the city, the original one standing opposite Jama Masjid takes the cake. Hidden in the midst of meandering streets and bursting crowds, this place is not easy to find. But if you just have one day to spend in Delhi, many would recommend you to spend it religiously at this doorstep of heaven. The aroma of Biryani, tikkas, kebabs beckons you from quite far you must not leave without trying out their Mutton Burra, Mutton stew, and Badam Pasanda. For desert, the kheer Benazir and Shahi tukda stand out (Just look at those royal names!) The most fascinating dish though is the Tandoori Bakra – a full goat stuffed with dry fruits, basmati rice, minced meat and spices! But you need to order a day in advance with a 50% down payment. This rich delicacy, of course, does not come cheap. Priced at Rs 3500, it is a perfect amalgamation of Mughal Indian food fit for kings. With several outlets across the city, it’s hard to miss this giant king of kebabs, tikkas, rolls and flavoured kulfi. Huge succulent tikkas are wrapped in Rumali Rotis to transport you to a whole other universe. Tender meat and delectable chutney that perfect complements the meal is their hallmark of fame and their famed rolls have people travelling from all parts of the city just to grab a bite! With an open kitchen and small eating area, the place is usually crowded and thronging with eager customers. This one is perhaps one of the oldest and most famed parts of Delhi. Navigating through narrow streets and ancient architecture of the Mughals, it’s hard not to stop and imagine the older ages when this place was the administrative and political hub of the country. Artisans, sweet shops and of course the parathe shops that sometimes date back to a hundred years, this part of Delhi, also popularly known as Old Delhi has managed to preserve the old world charm through its preservation of recipes, techniques, and familiar aromatic smell. This place has a variety like no other. From Banana Paratha to Banana Chutney, flavoured Kulfi to the thickest, sweetest fragranced Lassi- nothing is left to the imagination! To truly get a whiff of the opulence of the Mughals, this is one place that you cannot miss. A bustling part of South Delhi, the streets behind Jamia Millia Islamia University are a foodie’s go-to place for instant gratifying food. While some restaurants are affluent and charge sky-high prices, for the most part, this place caters to a student’s pocket too. Mesmerizing smells of roasting kebabs and fresh tikkis seduce you to drool as you walk. Take your pick from authentic Biryani and kebabs and be dazzled by the passion of very helpful staff in most of the joints. Friends Colony is broad neighbourhood and we recommend any place but some places like Al Bake and Chaska stand out. Try out the rest of the area and the amazing varieties of kebabs, tikkas, biryani and even Kashmiri food that places in Batla House and New Friends Colony have to offer. Arguably the best pastries in town, several locals swear by it’s great food. Soft and fresh macaroons greet you alongside a platter of assorted chocolates and cupcakes. The oldest bakery in town predates Independence and had a 20 ft ceiling with a sprawling lobby. Much smaller now, Wengers retains its charm with its impeccable taste and aura. Witness to the British era and rise of Connaught Place, Wengers remains abuzz with loyal customers and new fans. Get ready for the whole country to be served on a beautiful platter. Stalls from every state put up their best wares, handlooms, handicrafts and vintage beauties under the open sky. The cafeteria is a colourful exhibition of the country’s indigenous foods served by the natives themselves. So theplas, momos, hilsa, duck curry, uttapam- all cooked in the traditional way and served under one massive roof. They also hold regular state exhibitions to highlight a particular state’s culture and its history. 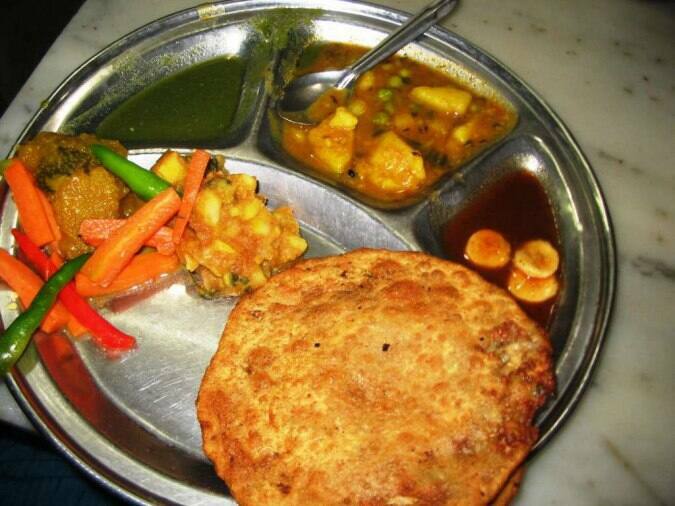 Breakfast or lunch, snacks or a party, Delhi is incomplete without it’s Chole Bhature. 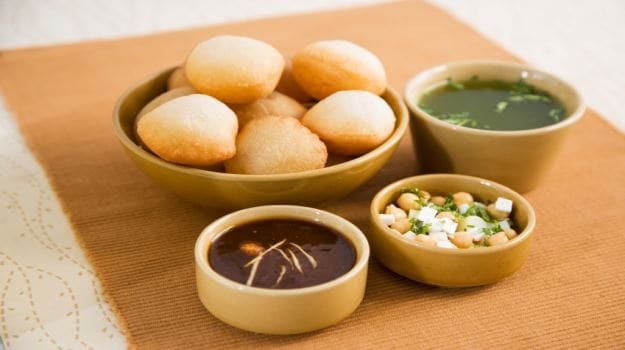 Fluffy bhature and spicy chole are the tickets to a full meal that is completely paisa vasool! Sitaram Diwan Chand (Paharganj) and Kake Di Hatti (GTB Nagar) are popular favourites. La Phing at MKT. And the best part? It’s completely vegetarian! Popularly known as Majnu ka Tilla, this place is a quaint corner tucked away from the harsh city and almost resembles the paving lanes of Dharamsala. This refugee camp is home to Tibetans and is the bustling area of Tibetan praying flags, mediation bowls, La Phing, Tingmo, cafes and friendly monks. Here the air smells different with the incense from the monastery and is full of meditative Buddhist hymns that calm the nerves. Full of tiny cafes to high-end restaurants and rooftop bars, the place boasts of authentic Korean, Tibetan, Indian and Chinese Cuisine like no other. Delhi has a rich street food culture that woos people across all demographics. The sweet golgappa is a beloved favourite among locals and is different from other varieties across the country due its elongated shape and tangy water. (Do check out the details in our foodie lists for Kolkata, Bangalore, and Mumbai)The stalls at Chandni Chowk win in this aspect too and a special mention must be made of Shree Balaji Chaat Bhandaar and Ashok Chaat Bhandaar. Interestingly, Delhi has a dedicated place for Bengali puchka fanatics at C.R. Park. too! Scribbler. Wanderer. Itching to trek Valley of Flowers, ace the ukelele and give contemporary dance a try. 10 reasons to Visit Ladakh even if you don’t trek! The Long Walk – Hampi to Sri Lanka – 3000 Km!